Most likely this is an unauthorised use of Mr Vladimir Putin's image which is being used for financial gain by the company. Most likely this is an unauthorised use of Mr Vladimir Putin's image which is being used for financial gain by the company. The image has been modified to a caricature-like representation. The image itself is unflattering, uncomplimentary and potentially defamatory as it arguably creates a wrong impression and may be said to be injurious to Mr Vladimir Putin's reputation. It is unlikely that the company has a copyright over the image or is licensed to use it, Nikolai Lazarev, barrister at 3PB specialising in international commercial disputes and international arbitration thinks. According to expert If a company uses an image of an individual with significant reputation without their permission in a promotion of their product they may be committing the offence of 'passing off' if the actions of the company give rise to a false message which can be understood by a significant section of the general public that the product has been endorsed, recommended or approved by the individual in question, in this case Mr Vladimir Putin, especially when accompanied by a slogan 'Hello My Name is Vladimir'. “Under Scottish law Mr Vladimir Putin or someone on his behalf can apply to the relevant Scottish court for an interdict, which is an injunction to stop the unauthorised use of his image and even obtain compensatory damages for any loss of reputation (defamation) which he may have suffered as a result”, - Lazarev explains. 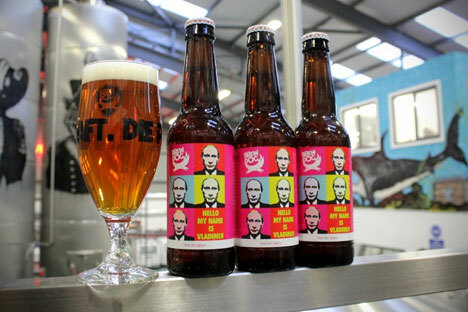 - It is in BrewDog's best interest to seek proper legal advice before continuing to distribute their beer bearing the satirical image of the president of Russian Federation. The Scottish brewing company BrewDog has released a new beer called Hello My Name is Vladimir, with stylized portraits of Russian President Vladimir Putin on the label.